Francis J. 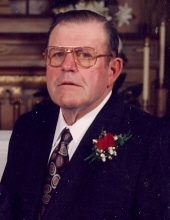 "Jim" Ellsworth age 81 of New Hampton, IA, died peacefully surrounded by his family on Saturday, March 16, 2019, at MercyOne Medical Center in New Hampton. A Mass of Christian Burial will be held 10:30 a.m. Wednesday, March 20, 2019, at Holy Family Parish, New Hampton with Rev. Brian Dellaert celebrating the Mass. Friends may greet the family an hour prior to the Mass at the church on Wednesday. Interment will be held at St. Bridget Cemetery - Pinhook, rural Fredericksburg with Tom Carolan, Trevor Ambrose, Rich Deutsch, Floyd Zimmerman, John Martin, and Loren Slick serving as pallbearers. Honorary pallbearers are Camden and Carsen Bruns, Jaedyn and Ava Birchmier, Trevor and Kaelyn Ambrose, Ross, Carlee and Evan Ellsworth, Kylee and Kara Dunphy, and Paul Ellertson. Francis James "Jim" Ellsworth was born September 5, 1937, in New Hampton, IA, the son of Henry and Eva (McGinn) Ellsworth. He attended school in Fredericksburg, graduating from Fredericksburg High School in 1955. During this time his close friends and family used his nickname "Ole". Jim married Karen Gitch on April 11, 1959, in Sumner, IA. To this union seven children were born. The couple later divorced. Jim enjoyed driving around the countryside, watching western's and old TV shows, and spending time with his friends. He loved and cherished his dogs over the years. Jim is survived by seven children; Dan (Renee) Ellsworth of Winneconne, WI, Darrell (Natalie Ellertson) Ellsworth of Eden Prairie, MN, Donna (Mark) Ambrose of New Hampton, IA, Dale (Mindy) Ellsworth of Waverly, IA, Debby Ellsworth of Ankeny, IA, Deanne (Sean) Dunphy of Council Bluffs, IA, Darcy (Greg) Bruns of Colorado Springs, CO; twelve grandchildren, Ross and Carlee Ellsworth, Paul Ellertson, Trevor and Kaelyn Ambrose, Evan Ellsworth, Jaedyn and Ava Birchmier, Kylee and Kara Dunphy, Carsen and Camden Bruns; special friends, Tom and Eileen Carolan of Waucoma, IA; a dear cousin, Paula Ellsworth of Iowa City, IA. To send flowers or a remembrance gift to the family of Francis "Jim" Ellsworth, please visit our Tribute Store. "Email Address" would like to share the life celebration of Francis "Jim" Ellsworth. Click on the "link" to go to share a favorite memory or leave a condolence message for the family.